Instrument of three rings pivoted together so that it may be folded flat when not in use. The two outer rings which are halved to fold into each other, have rounded off outer edges. The central ring is a flat strip. One quadrant of the meridian ring is marked on its inner face with a degree scale (0 to 90) reading from the pivot of the outer rings and divided to 2. A hole, presumably for a suspension cord, is drilled vertically through the ring at the 45? point. The rest of the ring is empty on both sides except that on the reverse in the quadrant diametrically opposite that containing the latitude scale are traces of a scale that has been scraped away. The second outer ring is engraved on each side in two quadrants (which complement each other on each face) with a semi-circular hour scale 1 to 12 reading to 30 minutes. Trace of an earlier scale which has been removed are visible at the beginning facing towards the latitude scale. 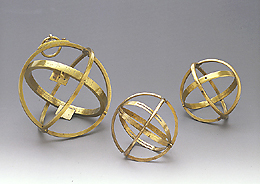 Pivoted within the meridian ring is the third, flat, ring engraved in one quadrant with a zodiac (solar declination) scale. In the side of the ring opposite this is a sighting hole. The ring may be rotated on its pivots within the hour ring so as to indicate the hour by its edge reading against the two hour scales when a point of light is led to drop through the pin-hole onto the zodiac division appropriate for the date of observation.